For me, authenticity when it comes to food can be a double-edged sword. On one hand, a restaurant can be viewed as legitimate and respected by those who seek out authenticity. However, it can also be very bad for business, especially when the majority of their potential customers neither care or even know what authentic looks and tastes like. As I've stated over and over again, restaurants are in the business of making money. They are not there to satisfy a few food bloggers and/or authenticity aficionados. Therefore, as much as some people loathe places such as Sushi Garden and Sushi Town, they have their loyal following who crave good portions at low prices. 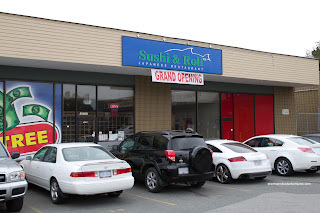 Joining the fray is Sushi & Roll which is another Korean-operated sushi joint in the same vain as Sushi Garden and Sushi Town. Located in the heart of Whalley, it strives to serve up acceptable food in large portions and at reasonable prices. We started with the Spicy Salmon Sashimi which looked a lot like the one you'd find at the aforementioned sushi joints. 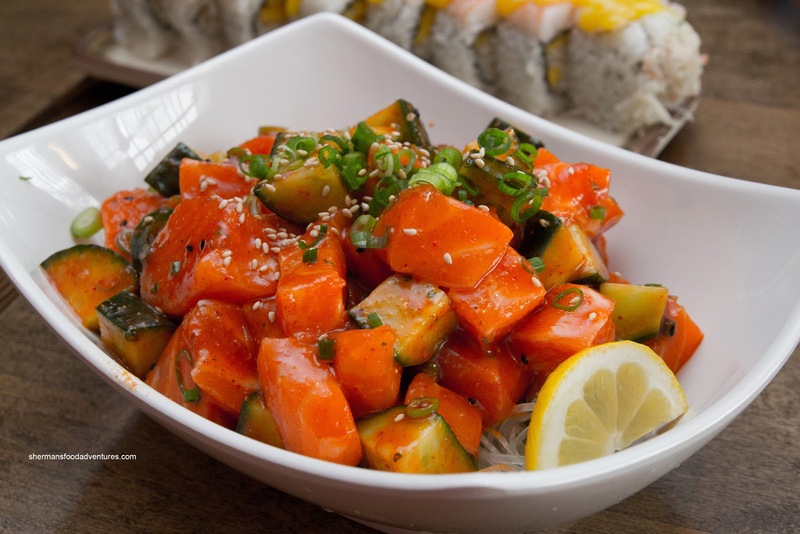 The large mound of salmon and cucumber were only slightly inflated by the daikon underneath. We found the salmon to have a bouncy texture which was pleasing. However, the fish itself was a little bland, but then again, there was sauce (which was only mildly spicy). 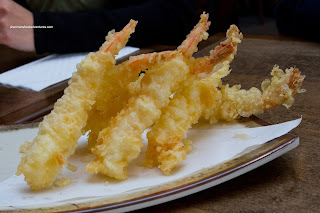 Next was the Ebi Tempura which arrived fresh from the deep-fryer. The batter was light and crisp, not sporting too much grease. For the shrimp itself, it was cold-water crunchy, yet a bit bland (due to the rinsing I'm sure). 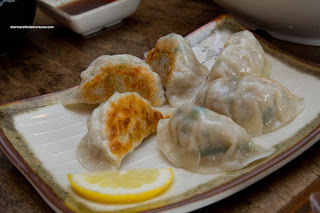 Resembling more like a Korean Gunmandu, the Gyozas were okay. The filling had a decent amount of greens and was on the denser side. There was a good amount of onion flavour as well as pork. If we looked at these as merely dumplings, they did the job, but for those who seek authenticity... yah, these were not gyozas. Onto our first roll being the Awesome Roll (sounds a lot like Sushi Town eh?). The inside had imitation crab meat, cucumber, avocado, masago and mayo while the outside was salmon, green onion, mayo, masago and bonito flakes. The rice had a nice texture, yet lacked flavour. A pretty good roll for $6.95. Next up was the Mangodise Roll. 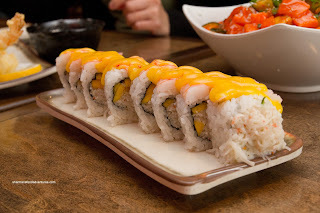 It was comprised of mango, cucumber and imitation crab meat in the middle with ebi on the outside as well as mango sauce. The sauce had quite an impact but for the mango pieces themselves, we could've stood for more. But for $4.50 (on special the day we went), we weren't that concerned. 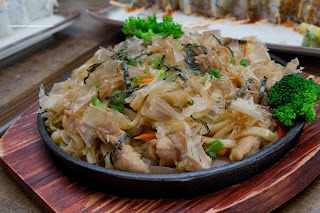 Lastly, we had the Yakiudon which arrived on a non-sizzling cast iron plate. This is pet peeve of mine - why serve it on a hot plate if it ain't hot? Anyways, the noodles were wet while the predominant flavour was sweet. There was too much red pepper too. The chicken was moist and tender though. I'm not trying to be anti-climactic here, but the meal was pretty much predictable. 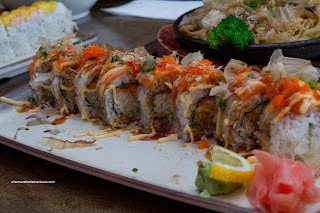 It was almost a carbon copy of meals we had at Sushi Town and Sushi Garden (but possibly with a bit more care put into the food). So yah, it ain't authentic, but it sure is inexpensive and the portions are pretty good too.